Postings about special events happening at the club. The Fredericksburg Fly Fishers will host the 2018 Oktoberfisch at the South Llano River RV Resort from Fri, Oct 19 thru Sun Oct 21. The three day weekend event will be filled with fly tying, demos, raffles, vendor booths, and of course fishing. Registration and more information can be found at: http://www.fredericksburgflyfishers.com. Support the Willow Waterhole project by participating in the Second Annual Brays Bayou Invasive Fish Round-up and Carp-A-Thon. 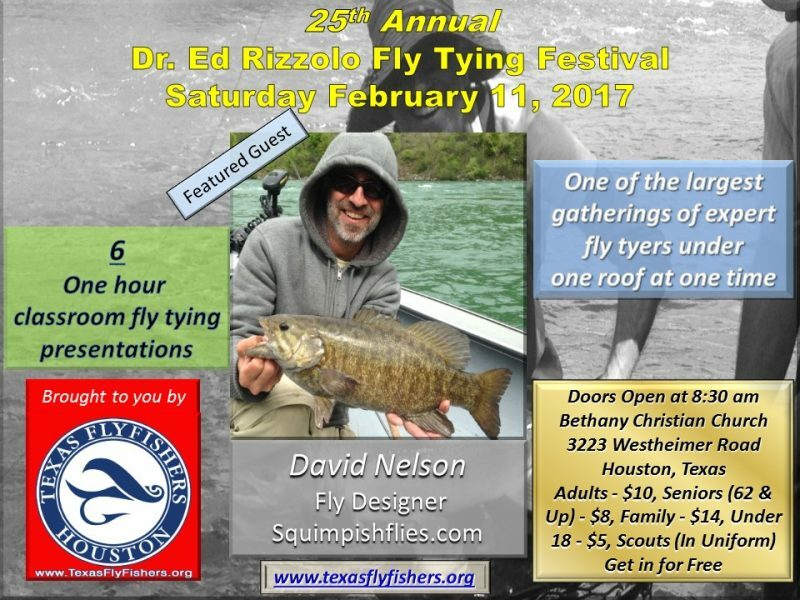 In cooperation with Texas FlyFishers and sponsors Willow Waterhole and Brays Oaks Management District. Due to the weather, the Mini-Expo scheduled for Saturday, August 26, 2017 has been cancelled. Also, the Tuesday, August 29, 2017 monthly meeting has been cancelled. The next monthly meeting will be Tuesday, September 26, 2017. Details regarding the September monthly meeting will be posted before the meeting. Mark your calendar for the 9th Annual Texas FlyFishers Mini Expo on Saturday, August 26th. The venue for this year’s event will be held at the Terrace United Methodist Church, 1203 Wirt Road, Houston, Texas 77055 from 9:00 am to 4:00 pm and it is open to the public. Welcome to the Texas Council!! The Texas Council was formed this fall, as there was a strong desire to unify our state. Texas was divided with the Northern clubs belonging to the Southern Council and the rest of the state belonging to the Gulf Coast Council. A unified state will be beneficial in so many ways. On November the 26th, the Federation of Fly Fishers approved the formation of the Texas Council. The new Council has been off to an excellent start, with the help of so many wonderful, and talented volunteers. Without them, this dream would have never came true. We hope you find this website to be of great value, and easy to use. Please provide any comments, suggestions, or activities you wish the council to partake in. We would greatly appreciate your support. Latest update on the festival. For those of you who have been asking, there is a schedule of presentations included in the link provided below.